The Visitor Center in the Garnier Building is open for self-guided touring during regular park hours. The De la Ossa Adobe is available for free guided tours by appointment only. Take the 101 Ventura Freeway to the Balboa off ramp. Go South on Balboa to Moorpark--one block before Ventura Blvd. Turn left onto Moorpark and park on the street. There is no parking lot. Enter through the gate. The natural spring provided a year-round source of water for the ancient, autonomous, village of Siutcanga. The village was home to Chumash, Tongva, and Tataviam people, who later were called "Fernandeños" by the Spanish due to the enslavement of these three groups to the San Fernando Mission. An excellent description of this village was recorded as part of the 1769 Portola Expedition. This Spanish expedition reached the San Fernando Valley and named it “El Valle de Santa Catalina de Bononia de Los Encinos” (The Valley of St. Catherine of Bononia of the Oaks). Take the 101 Ventura Freeway to the Balboa off ramp. Go south on Balboa to Moorpark Street--one block before Ventura Boulevard. Turn left onto Moorpark; the park will be further on the right. Street parking only except for authorized vehicles and those parking in ADA designated areas. Enter through the gate. 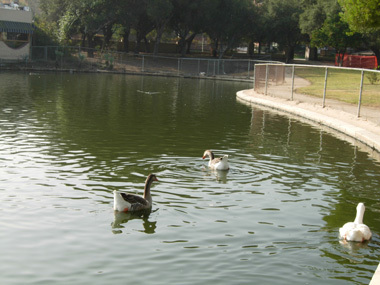 The pond, constructed in 1874 by ranch owner Eugene Garnier, is fed by the natural spring that has attracted settlement in the area for thousands of years. Guided tours of the De La Ossa adobe are offered Wednesday through Sunday by appointment. The adobe is also opened for self-guided tours pending staff. To ensure that a guided or self-guided tour is available during your visit it’s best to call ahead of time. Interpretive school group programs aligned to California Education Content Standards are offered Wednesday- Friday. Schools must make advance reservations at least two weeks in advance by calling the park at 818-784-4849 or emailing losencinos@parks.ca.gov. Special events, such as “Haunted History” in October and “Victorian Day in the Park” in the spring are opportunities for visitors to join State Parks and the Los Encinos Docent Association in lively and fun filled days that highlight the historical significance of the park. For information, please contact the park at 818-784-4849 or email losencinos@parks.ca.gov. You can also visit the Los Encinos Docent Association website at http://www.losencinos.org for information on upcoming events. 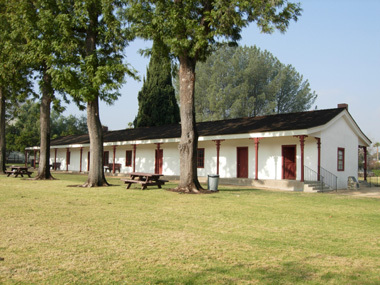 Los Encinos State Historic Park has a number of picnic areas available for day use. To reserve an area for a party, wedding, or other special event, or obtain more information about rules or fees, contact park staff at 818-784-4849 or email losencinos@parks.ca.gov. If you would like to perform commercial or student filming or photography at the park, you need to obtain a filming permit from the State Park filming office: 818-880-0358.